In examining exactly why video games have held such an appeal to me over the years, the best answer I have been able to come up with is that they can be used as a form of escapism; an avenue to worlds untold where one can find themselves exploring that which they would not see in day-to-day life. This is a wide-sweeping statement, of course, as entire sub-genres of games have been established to focus on simulating real-world situations and environments as perfectly as they can, but such groupings will be largely ignored during the rest of this writing. Setting the ‘simulator’ sub-genres aside, we, the gamer collective, have come to an understanding that new and fascinating worlds all make sense, no matter how surreal they may appear on the surface. It is that very suspension of disbelief that game designers have come to expect of their players. Where, then, does the real-world illogical become accepted as standing norm when translated to video gaming? Let us start with the basics. 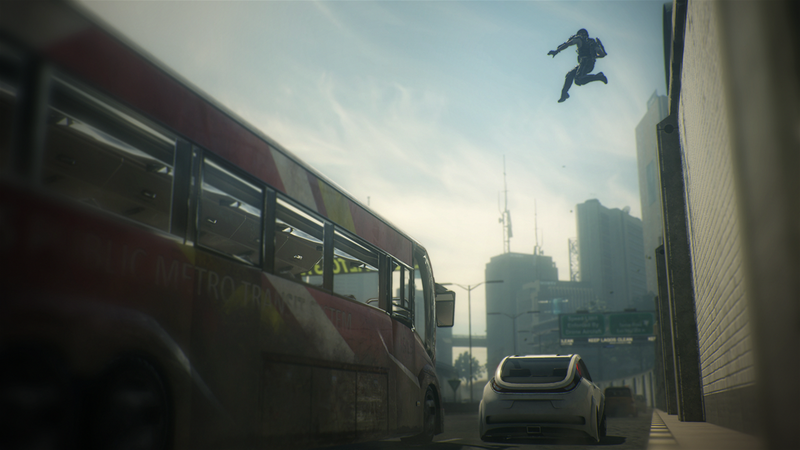 Illumination sets the stage for a game’s visual appearance. Be it global lighting to make navigation possible, directed lights casting shadows to paint a picture, or a mixture of both to deepen environmental immersion, light sources of all forms are prevalent in the current generation of game engines. Because lighting is depended upon for navigation, game designers have been forced into shoehorning some illogical placements of light sources. Take Skyrim for example: the hero delves into countless dungeons in the pursuit of adventure, many of which have been abandoned since the Nords of ages past used them as burial grounds and tombs. Hidden behind walls of cobwebs, locked behind ancient doors, or blocked by other means of restricting commoners’ foot traffic, these catacombs and tunnel walls are often lined with trays of candles or torch-bearing sconces that light the way forward. The question, then, is who lit all of these so recently? It is made abundantly clear at the outset that the Dragonborn is the often first to set foot in the area in many years, though scientific understanding is that combustible light sources rely upon a finite fuel source that is (relatively) rapidly consumed. Granted, the argument could be made that the world is one of magical mysteries beyond our comprehension (or outright defying the laws of physics), but such defiance is never explained. As such, the players are left to suspend their disbelief that the candles and torches had been lit more than mere hours before. 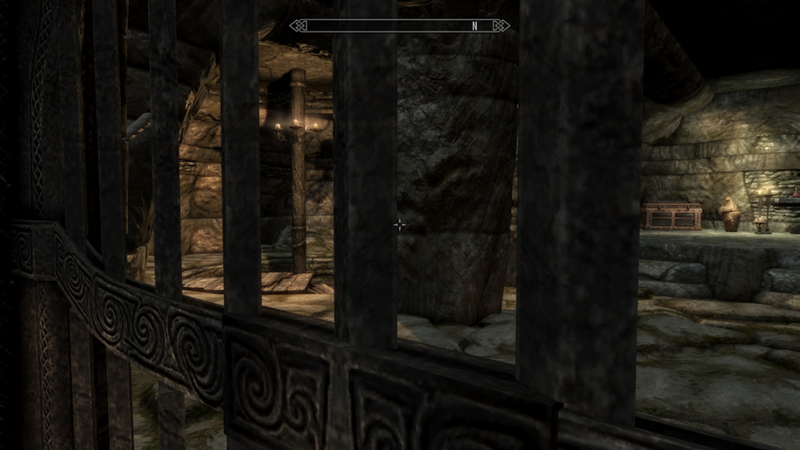 Use of the term ‘invisible walls’ is bound to bring back memory of some unpleasant experience(s) where the player found themselves guiding their character in a given direction only to be blocked by an impassable barrier preventing further progress. Being unable to move forward without logical reasoning can be irritating at the best of times, but years of late have had designers defining boundaries more concretely. Fallout 4 simply pastes “You are unable to travel further in that direction”, and linear games restrict travel off the guided path by locking doors or blocking openings with debris. Where game design must catch up, however, is during instances when access through logically-viable ports is blocked off. Ghost Recon Wildlands is a recent example that comes to mind. When seeking a point of ingress to any of the several given outposts, reinforced concrete ‘pillboxes’ built into the fence-line may be found. 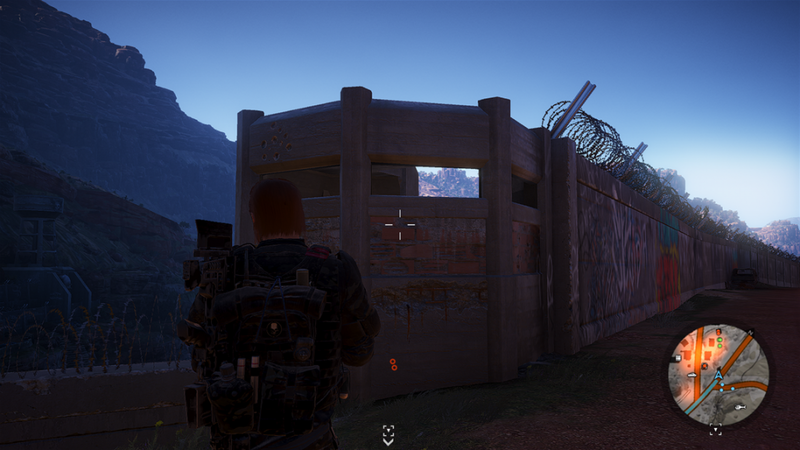 After dispatching the enemies inside, logic would dictate that the open window could then be mantled/climbed through, especially by a squad of military operators. Instead, the crew must continue around the fence to find another access portal. It was not until after making my way past a half-dozen (or more) of these restricted inlets that I realized I had forgiven ‘lazy’ design; these pillbox windows could have been gated with some fencing, steel rebar, or something otherwise tangibly impassible – anything to explain why an alternate route must be found. Most games will have enemies to battle and/or avoid, making the use of some rudimentary detection system a requisite. Speaking in broad terms, detection systems can be based on two core aspects: visual and auditory detection ability. If the player falls within visual detection range or makes too loud of a noise, enemies will be alerted to their position (or elevated to various states of caution). It is in the very detection restrictions, however, that certain some disbelief must be granted or forgiveness for deviating from real-world expectation or equivalencies. 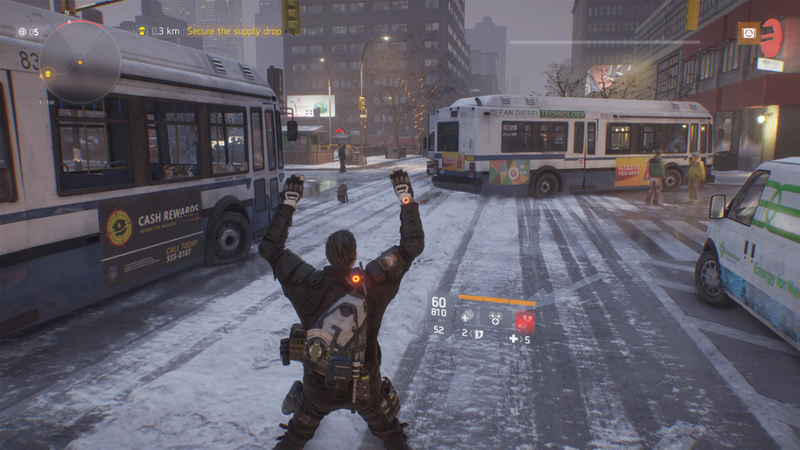 Considering another Tom Clancy title, The Division, patrols walking down the barren New York City streets have to be within half a city block or so before becoming suspicious of the player. In a real-world situation, a single person walking down the middle of the (empty) street can be seen from several blocks away without issue. Why is it, then, that we have to accept that the NPCs’ detection range is reduced to a few dozen metres, even in optimal conditions? The reasoning here is simple, if not slightly obscured; real-world detection ability on NPCs (without altering/reducing their spawn density) would leave the player character in a constant battle to the point of unparalleled exhaustion. Even small-arms fire would draw in opponents from all directions, visual detection would be near-immediate (without sneaking in cover), and The Division would have its players spending 90% of their time hunkered down, defending some meaningless position against nigh-unending waves of opposition until the enemy simply runs out of expendable characters. What is more is that a true-to-form detection ability installed to the NPCs would make all but the most die-hard and tactical players question their decision to even bother with the painstaking approach, undermining the reason for a stealth system in the first place. At some point, just about everyone has had a discussion with someone else regarding a TV show or movie only to hear that some aspect of the action or narrative is improbable to take place, or ‘unrealistic’ in its execution. Rushed romances, physics-defying stunts, or an abundance of all-too-convenient coincidences are but a sampling of elements that can be picked apart in the name of ‘accurate’ presentation. Why is it, then, that video games are treated differently? Boiling them down to basics, both film and interactive media present a foray into exceptional situations not found in daily life. Their execution differs, of course, with film being a rhetorical performance; the result of a video game experience is instead largely credited to the ability of the player. It may be that through interacting with the game itself, however, that the player finds themselves overlooking improbabilities not otherwise forgiven with film adaptations of similar content material. In suspending their disbelief when real-world expectations translate poorly to in-game environments and situations, gamers directly step into a greater level of immersion in the content as fewer detractors pull them back out. It is, after all, a heightened sense of immersion/plausibility that draws in many gamers to appreciate the source material; what presents as curious, however, is how effort is made at the behest of the participant to push into the content, instead of being pulled into it as has previously been the case with other media platforms. Next articleWhat Do Video Games Provide That Is Unique To The Medium?